Our voices are powerful, and monologues are an ideal platform for sharing our stories and perspectives with the world. 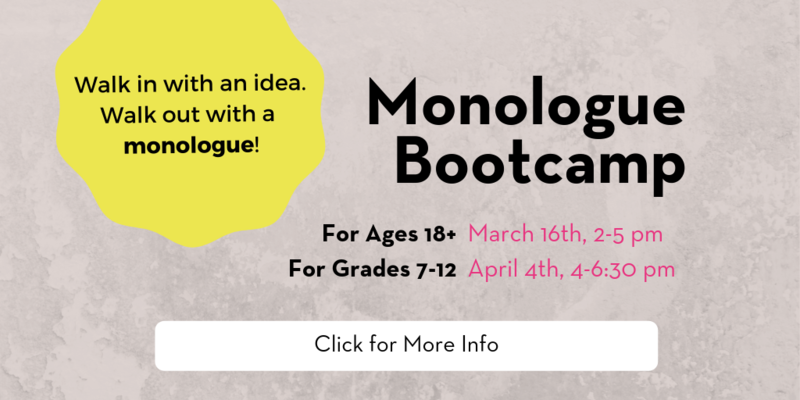 We’re calling these workshops boot camps because we’ll take you through the monologue process from start to finish in one session! The workshop will begin monologue tips and structure, move on to idea generation and writing a first draft, include some peer sharing and revision, and culminate with an informal sharing of your work-in-progress with the class. Participants of all experience levels are welcome - no prior experience necessary. There will be two separate workshops, one for participants 18 and up, and for participants in grades 7-12. Both workshops will be held at Philadelphia Young Playwrights' Learning Lab on 1219 Vine Street, 2nd Floor. Questions about this program can be directed to 215-665-2226 or programs@phillyyoungplaywrights.org. PYP is partnering with three branches of the Free Library of Philadelphia to bring playwriting residencies to three different neighborhoods across the city. Supported by the Mayor's Fund for Philadelphia, Story to Stage is open to students in grades 4 -12 who are interested in learning more about playwriting and theater making. We are thrilled to once again partner with the Arden Drama School Summer Camp to offer two week-long Playwriting Camps this summer for students in grades 6-8 and 9-12. Registrations occur through the Arden. ...and more! This class is tailored to student questions and interests. Opportunities to interview and learn from professional playwrights and theatre artists will also be a part of this amazing experience. Business of Being an Artist dates will be announced soon. Check back for details!